Located 100km north west of Kawthaung, Black Rock is one of the best dive sites in Burma’s Mergui archipelago where it is possible to see almost anything. This is an exposed dive site in open seas a long way from anywhere else and therefore acts as a natural magnet for marine life. It is a dive site for experienced divers as currents can be strong here and some of the nicest parts, with the biggest fish, are in deeper water. Whether you dive the east or the west side of the rock may depend on the time of day, to take advantage of the sunlight. When currents are strong it may not be possible to pass around the north and south ends of the island. Currents on the island tips can act like a washing machine and often flow downwards. Visibility can be as little as 10m but is usually better than that, often exceeding 40m. Burma liveaboards will normally spend a day here and this site is definitely worth three or four dives. Night dives are also excellent. This limestone rock is part wall dive and part sloping boulder and coral reef. The reef descends down past 40m, brown disc anemones, red finger coral and purple soft coral covering the rocks. In deep water it’s usual to see white tip reef sharks. Bull sharks, leopard sharks, grey reef sharks and silvertips are also possible. 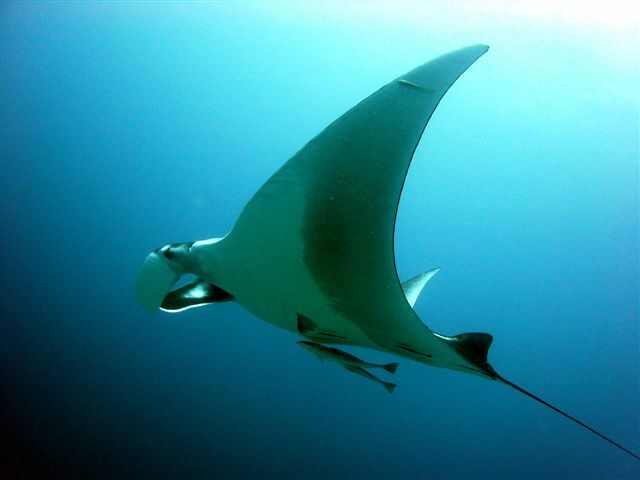 Manta rays and eagle rays are fairly common visitors. Less common but very spectacular are the squadrons of mobula rays that fly through in formation. Other pelagic visitors are giant, chevron and pick handle barracuda plus trevally and pompano. Rainbow runners sweep past divers at speed whereas long fin (tiera) batfish cruise past at a slower pace, often approaching divers and posing for photographs. The south west side of the island is a very colourful area with orange cup corals, gorgonian sea fans, crinoids and encrusting sponges. Tiger striped anemones, rarely found elsewhere, are also common. Schools of blue lined snapper, fusilier, soldier fish and jacks frequent the edges of the reef. Black spotted pufferfish are numerous as are lionfish and scorpionfish. Hawkfish are in the seafans, moray eels protrude from coral and rock crevices. Look for zebra morays and white mouthed morays as well as the very common white-eyed and fimbriated varieties. Banded sea snakes are also seen often, as are octopus and cuttlefish. At night the orange cup corals open up, crabs and lobsters become active and moray eels swim freely over the wall. Nudibranchs are numerous, Dancing Durban (hingebeak) shrimps and banded boxer shrimps are everywhere.